The Marion Public Library in Grant County recently received a Library Services and Technology Act (LSTA) grant for $6,559 from the Indiana State Library. The grant was used to purchase 4 computers and a scanner for the library's Indiana Room. 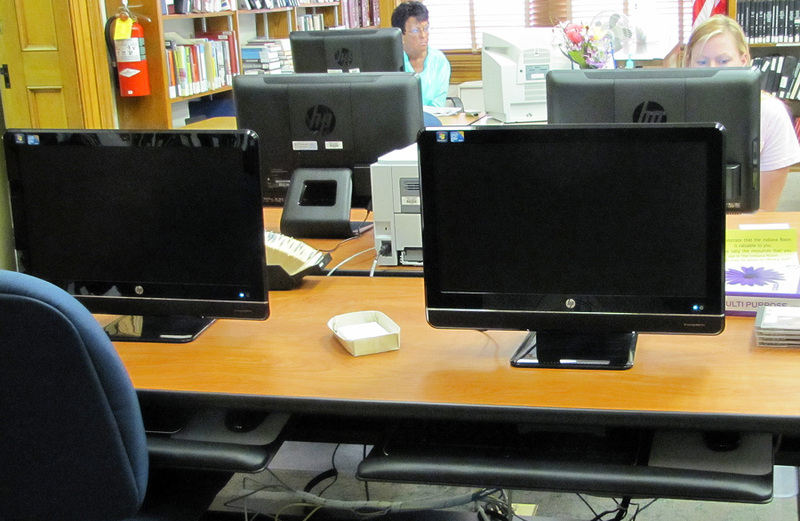 The library matched the grant and purchased a printer and ergonomic work stations for the computers. With this new equipment, Indiana Room patrons have access to current technology for their genealogy research, and the Indiana Room can also provide computer training sessions to expand patrons' research skills. Thanks to Rhonda Stoffer, Indiana County Genealogist for Grant County, for sharing this information. The Indiana Genealogical Society now has 688 databases in the Members Only area. They cover all 92 Indiana counties and encompass 500,000 records. Researchers who have not visited downtown Indianapolis recently - particularly those going to the Indiana State Library - should be aware of changes if you park on the street. When the city recently privatized their parking meter system, the charges themselves increased, and you now have to pay to park on Saturdays. Additionally, if you let your meter expire, it now costs you $20 instead of $5. Two hours is the maximum time you can pay for at one time. You might also want to consider doing some of your research at area libraries such as Plainfield, Greenfield, Noblesville or Anderson. The Genealogy Center of the Allen County Public Library in Fort Wayne is holding a free military seminar on Saturday, November 12, with the theme, "You Say You Want A Revolution." Information on the Daughters of the American Revolution (DAR) and Sons of the American Revolution (SAR) will be presented, as well as a session on Revolutionary War pensions. Tours of the Genealogy Center & one-on-one consultations with SAR And DAR experts will also be offered. For more information, please see the seminar brochure. The seminar is free, but registration is required - call (260) 421-1225 or e-mail genealogy@acpl.info to register. The websites of the Indiana State Library's Genealogy Collection and the Indiana State Digital Archives have been named among Family Tree Magazine's list of "2011 Best State Websites." The library's site contains several statewide indexes, including for marriages, deaths, newspapers and biographies. The Indiana State Digital Archives is the online repository for the Indiana State Archives and contains several digital collections, including Indiana military records. The complete list of 2011 Best State Websites may be viewed at http://familytreemagazine.com/article/2011-best-state-websites. The Indiana Genealogical Society now has 686 databases in the Members Only area. They cover all 92 Indiana counties and encompass 500,000 records. The La Porte County, Indiana Genealogical Society will meet on Tuesday, November 8 at 7:15 pm at the Swanson Center for Older Adults (910 State Street, La Porte IN). Dr. Barbara Backer will offer glimpses into local history, medical history and family history when she shares the story of Dr. Sylvanus Everts. The meeting is free and open to the public. The Indiana Genealogical Society now has 682 databases in the Members Only area. They cover all 92 Indiana counties and encompass 500,000 records. I am trying to find more information on my great-grandfather, Anthony Bilinski, and also any photos of his cigar factory, which was located on Chapin Street in South Bend, St. Joseph County, Indiana in the late 1890's - early 1900's. The BILINSKI name was carved in stone on the front of the building. Any information would be greatly appreciated. I am hoping to touch base with anyone who might have any leads on the RED CLOUD community in Decker Township, Knox Co. IN. My 2GGF John C WILLIAMS(b:OH 1847)died in "REDCLOUD" in 1886 from Milk sickness. These details come from the widows pension, his wife Martha[nee GREATHOUSE] WILLIAMS which was stated under oath. John his wife and children are found on the 1870 & 1880 census there. No one knows where he is buried. My husband & I in July traveled to Knox Co and visited every accessable cemetery in existance there. We found there is a Redcloud cemetery. I had never previously seen any mention of this cemetery in a book or online. I think they lived near to the where Orrville later came to be. Concerning Johns burial, is only an oral tidbit or clue that has been mentioned...that he was buried in the "soldiers cemetery", they were destitute by the sounds of it upon Johns death, Martha and their 5 young children left Indiana for Illinois to her family there. I am certain no lasting marker was laid for John. I have even looked in Wabash Co,IL records as they lived just on the Indiana riverbank, making a living on the land and river. I have not found much in way of records for Decker twp. Indiana, I'm thinking or assuming most perhaps have been lost to the floods that seemed to frequent the township. I have many records of John and his wife Martha GREATHOUSE WILLIAMS, but wish to find out if any thing else is out there. I am looking into my Grandmother who was born in Indiana about 1892. Her name is Lillian Mae McCleary. This is the only information I have on her. I am also looking if she was married there to an Edward Leslie Cook from Keokuk, IA. Any help would really be appreciated. Looking for the divorce date of Marie Schroeder Graves and Thomas J. Graves, in Tell City, Perry County. They were married on June 29, 1937. Marie married James B. Lindsey and moved to Alabama in 1940 or 1941. The Indiana Genealogical Society now has 681 databases in the Members Only area. They cover all 92 Indiana counties and encompass 500,000 records. The Southern Indiana Genealogical Society will meet on Thursday, November 3 at 7 pm in the Strassweg Auditorium of the New Albany-Floyd County Public Library (180 W. Spring St., New Albany, IN). David Barksdale, Floyd County historian, will speak about the Floyd County Historical Society, the Padgett Museum and its current Civil War exhibit. The Indiana Genealogical Society now has 679 databases in the Members Only area. They cover all 92 Indiana counties and encompass 500,000 records. FamilySearch has updated the Indiana marriage index 1811-1959 that is in progress. Entries from 3 more counties have been added - Floyd County, Fountain County and Fulton County - and there are now over 1.9 million entries representing 30 of Indiana's 92 counties. The Genealogy Center of the Allen County Public Library in Fort Wayne will hold a class, "Capturing Personal History & Memories," on Monday, October 24 from 2 to 4 pm in the library's Meeting Room A. Dawne Slater-Putt will dsicuss techniques for organizing, brainstorming and writing, and will give several writing exercises for the audience to participate in. The class is free - to register, call (260) 421-1225 or e-mail genealogy@acpl.info. The Genealogy Center of the Allen County Public Library in Fort Wayne will hold a class, "Let's Start Blogging," on Monday, October 31 from 2 to 3 pm in the library's Computer Classroom. In this hands-on class, Melissa Shimkus will lead you in setting up your own genealogy blog and beginning to share your genealogy with the world. The class is free but space is limited - to register, call (260) 421-1225 or e-mail genealogy@acpl.info. Those with research interests in Delaware County should be aware that the Delaware County Building in Muncie, Indiana (which houses many county government offices, including the county clerk and county health department) is now closed to the public on Fridays. The closure is effective immediately and was approved by the county commissioners as part of a budget-cutting effort. The Indiana Chapter of Palatines to America, the German genealogy society, will hold their fall workshop on Saturday, November 5 from 9:45 am to 3:15 pm at the MCL South Cafeteria Banquet Room in Indianapolis (3630 S. East Street, Indianapolis IN). Dr. Marianne Wokeck, professor of history at IUPUI, will be the featured speaker. Topics will be: "The Effects of War on Migration and Settlement in the Eighteenth and Nineteenth Century Rhine Lands"; "Relocation from the Rhine Lands to the American Colonies and Young United States"; "What Was in It for Women? The Role of Female Immigrants Before and After the American Revolution." Registraton is $15 for Pal-Am members, $20 for non-members (lunch is not included in the price). Indiana librarians can receive LEU credits for attending. More information on the workshop, including how to register, is available on their website. The Genealogy Center of the Allen County Public Library in Fort Wayne will hold a class, "Before Crossing The Ocean: American Records of Our Immigrant Ancestors," on Sunday, October 30 from 1 to 2 pm in the library's Meeting Room A. Melissa Shimkus will show you what to look for in American records before searching for your immigrant ancestor overseas. The Genealogy Center of the Allen County Public Library in Fort Wayne will hold a class, "Genealogy As A Profession," on Thursday, October 27 from 10 am to 11 am in the library's Meeting Room A. Area genealogists who do research for hire will describe how they advertise their business, set their rates, etc. The Genealogy Center of the Allen County Public Library in Fort Wayne will hold a class, "Piecing The Census Puzzle Together," on Saturday, October 29 from 10 am to 11 am in the library's Globe Room. Melissa Shimkus will explore census research and how name changes, age discrepancies and changes in locality can affect your search. The St. Joseph County Archives & Records Center in South Bend (1140 S. Lafayette Blvd., South Bend, IN 46601) will host 2 open houses in October to celebrate Family History Month and American Archives Month. The open houses will include a tour of the Archives & Records Center facilities and an orientation of St. Joseph County’s genealogical and governmental records (wills, estate records, coroner reports, naturalization records, marriage records, divorce records, adoption records, civil and criminal records, etc.) to show some of its most interesting historical records and treasures from its collections. After the tour and orientation, there will be time for the staff to assist you in your own St. Joseph County family history research, so bring along a few ideas for records you would like to find for your own projects. The first Open House will be held on Thursday, October 13 from 4:30 to 5:30 pm, with time to do your own research until 7:30 pm. The second Open House will be held on Saturday, October 15 from 9:30 to 10:30 am, with time to do your own research until 12:30 pm. Please register by Monday, October 10 for the open house you would like to attend by calling the Archives at (574) 235-9091 (regular business hours are 8:30 am to 4:30 pm Monday-Friday). Free parking will be available on site. The Indiana Genealogical Society has added the October 2011 issue of IGS Newsletter, the society's bi-monthly newsletter, to the IGS Records section of Members Only. This issue includes a wrap-up of the Federation of Genealogical Societies' conference in Springfield, Illinois, as well as numerous news items from around the state. The newsletter is available for download in its regular size, as well as in a compressed version, so that those with slower Internet connections can download it faster. The Indiana State Library in Indianapolis will present a program, "Organize and Document Your Genealogy Research," on Thursday, October 27 from 5:30 to 6:30 pm in the library's History Reference Room. The program will offer tips for how to organize and document your genealogy research. You'll also learn how best to prepare for a research visit to a library. The Indiana Genealogical Society now has 676 databases in the Members Only area. They cover all 92 Indiana counties and encompass 500,000 records.